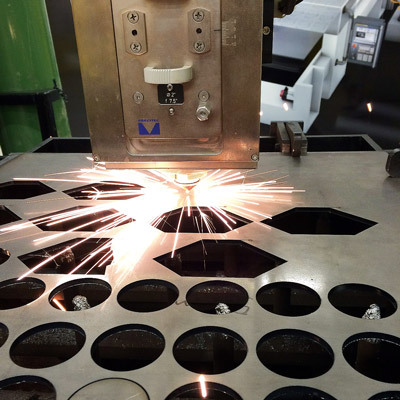 Automating your sheet metal fabrication facilities is easier than you might think. FANUC offers a range of smart solutions designed to open up your options and increase your productivity, no matter how big or small your business might be. In a nutshell the benefits of automation are better quality, increased productivity and lower costs. What is more, smart automation provides you with the flexibility to respond quickly to today’s changing and increasingly competitive market place. No matter how challenging you think your application or process might be, you can be sure that FANUC has a solution to improve it and keep you ahead of the game. 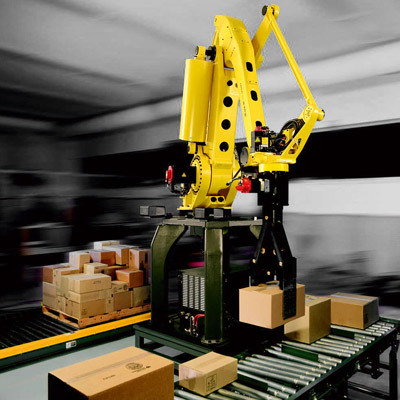 Depalletising, loading or line charging – these and many more front-of-line tasks can easily be automated using FANUC’s smart system applications and tailor-made solutions. Opening up your options, advanced CNC technology provides you with the power to make the most of your metal forming processes. 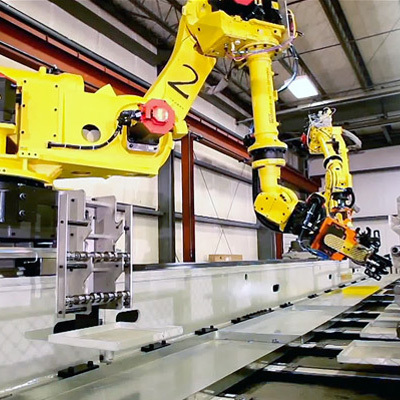 Whether it is bending, roll forming, spinning, deep drawing or stretch forming, reshaping sheet metal is more efficient with a FANUC CNC. FANUC provides customised products and interfaces to automate MIG/MAG, MIG pulse, TIG and plasma welding processes. To optimise your welding processes these packages come with their own generators. Delivering improved quality and cycle times, this is a particularly attractive option for small to medium-sized businesses that want to automate in order to reduce costs but do not necessarily have the volume to justify installing robots. Automating your entire sheet metal manufacturing process using tailored solutions is very simple. 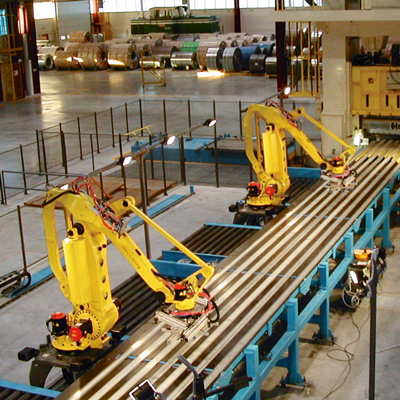 In a dedicated fabricating cell containing tending robots, plates can be cut, folded and processed, with workpieces travelling between welding and grinding stations on a conveyor. Once completed the workpiece then moves onto another belt for transportation to a paint spraying cell. FANUC CO2 laser featuring 2-D and 3-D cutting technology provides a reliable, precise and cost-effective way to cut sheet metal. Extremely precise, this method cuts metal up to 40 mm thick, leaving surfaces that exhibit superior smoothness. FANUC’s unique CNC Power Motion i makes an ideal alternative controller for large servo applications such as press machines. In practice, this translates to less power consumption, more control and precision than is possible using hydraulic technology. Cycle times are also reduced thanks to high-speed response features for quick axis start/stop and a high-speed execution cycles. Material stress, on the die cushion for instance, is also reduced. In order to meet specific industry and European standards integrated safety features are also available. 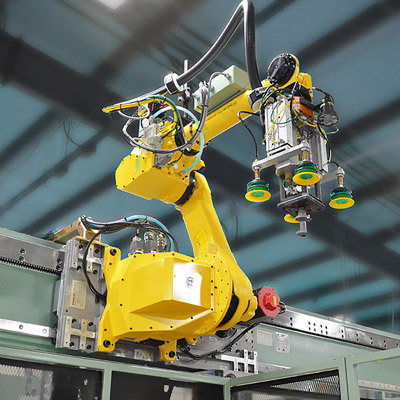 Coordinated motion functionality enables FANUC robots to work together, holding or manipulating workpieces for one another and providing exact work and travel angles. Automating the end of your production line increases your flexibility, enabling you to react quickly to the trends and challenges involved in providing intelligent and secure good quality packing, storage and logistics to the sheet metal industry. Wrapping, labelling, packing and palletising all involve strenuous and repetitive manual work – something that can easily be done by automated systems for optimised, cost-effective results. 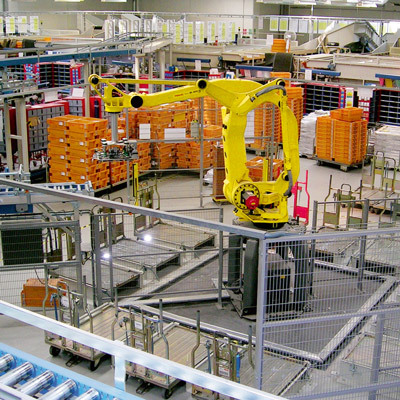 Equipped with FANUC’s vision system, iRVision, FANUC pick and pack robots maximise productivity on even the most demanding of operations. When packing cans the last row always poses a problem since the robot’s room to manoeuvre is restricted. To get around this issue you need a fast-moving robot capable of tilting the cans as it approaches the box. 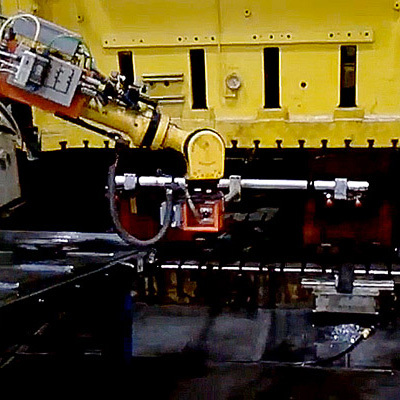 "Reliability has significantly improved since we installed the new FANUC robot. We’re noticing the difference in higher unit quantities." At FANUC we think creatively - and are experts when it comes to automation solutions. Why not let us inspire you with innovative solutions designed to meet the needs of your industry? No matter what it is, we will show you exactly what we can automate on your sheet metal production line.